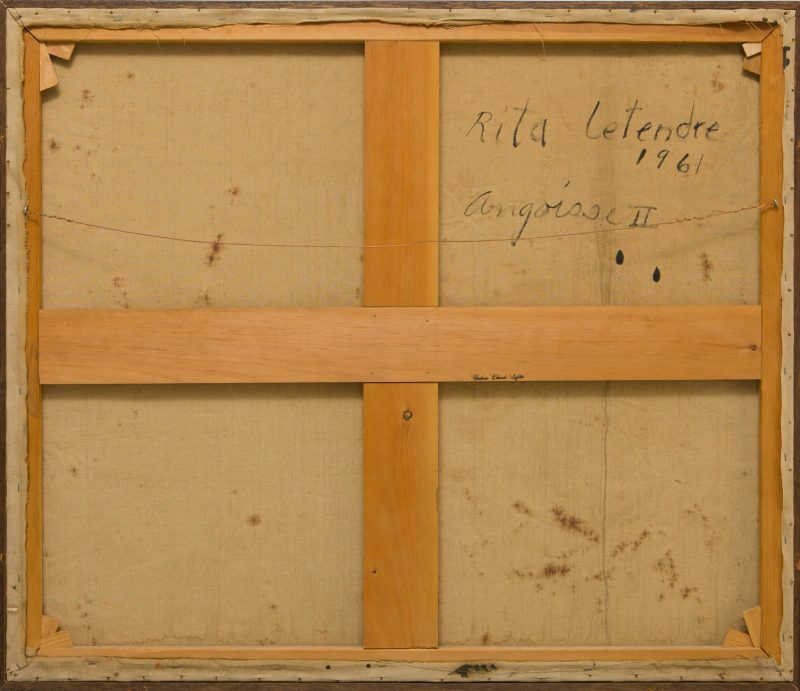 This spectacular work by Rita Letendre—painted during her Montreal years (1953-63), a pivotal decade in her career—is characterized by its growing intensity, mystical power, and perfect formal mastery. In the early 1960s, a more distinctive style emerged in Letendre’s work: the scale of her figures expanded across the canvas, and the quick palette-knife strokes, like beating wings or leaping flames, generated colours that were both explosive and dark. During this period, she quickly distanced herself from the pictorial approach favoured by the signatories to the Refus global, which she considered too restrictive. Instead, she immersed herself in her personal repertoire, seeking freer forms of expressive and spiritual power. Her particular use of gesture and materials gave her works a more lyrical, emotional framework. 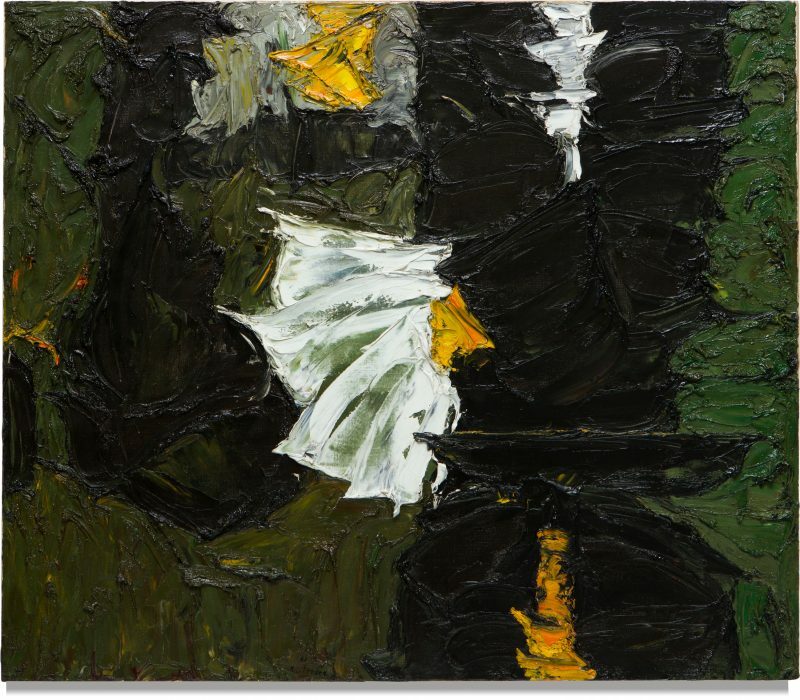 A few larger pieces that came out this new thrust were presented at the Montreal Museum of Fine Arts in 1961, along with works by her companion, Ulysse Comtois. A very large piece titled Augure, also from this group, has a palette and architectonic harmony similar to that in Angoisse II. What differentiates this work, however, is that the palette-knife strokes are surpassed by the artist’s masterful modelling, sculpting, and kneading of her material, as if it were the extension of some visceral entity. The black masses seem alive and organic, lifted from all sides by an earthly force, shot through by beams of light and incandescent embers, lit here and there under a fertile ground. Like a demiurge of painting, Letendre locates the drama, intensity, and energy of matter in the midst of a vibrant composition in which timeless purity meets a beating heart. Rita Letendre was born in Drummondville in 1928 to Abenaki and Québécois parents, and has lived in Toronto since 1969. She began her career in the 1950s after a brief period of study at the École des beaux-arts de Montréal, which she left to join the Automatistes. With them, she participated in the exhibition La matière chante (1954) and in Espace 55, at the Montreal Museum of Fine Arts (1955). In 1959, she won the Prix de la jeune peinture, and she received the Prix Rodolphe-de-Repentigny in 1960. In 2010, she became a member of the Royal Canadian Academy of Arts and received the Governor General’s Award in Visual and Media Arts. She was awarded the Prix Paul-Émile-Borduas in 2016, and the Art Gallery of Ontario presented a major retrospective of her work titled Rita Letendre: Fire & Light in the summer of 2017. PAIKOWSKY, Sandra. Rita Letendre. The Montreal Years / Les années montréalaises, 1953-1963, Montréal, Galerie d’art Concordia, 1989.